A former regional sports journalist and sub-editor who also wrote more than 20 books has died aged 80. Bruce Robinson, left, followed the fortunes of Norwich City FC for the Eastern Daily Press for 11 years during a journalism career which spanned more than four decades. Prior to joining the EDP, he had also served as the sports editor of both the Lincolnshire Free Press and the Spalding Guardian. Bruce also authored more than 20 books on subjects including local history, walking, roads and tracks, and football. Born in Long Sutton, Lincolnshire, Bruce was educated in Spalding and joined the Free Press as a junior reporter in 1951. He did National Service with the RAF in Worksop from 1953 to 1955, before becoming sports editor of the Guardian and Free Press, where he often covered local football clubs Spalding United and Holbeach United. He later worked as a sub-editor on both the EDP and Norwich Evening News before retiring through ill-health in 1993. 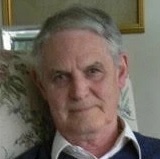 Bruce, who was married to Cynthia and had four sons, died peacefully at home in Sheringham, Norfolk, on 21 June. His funeral will be held at St Faith’s Crematorium in the town at 1.15pm on Monday 11 July. Bruce was a lovely man. A well-known and respected Norfolk character, his knowledge of local history and folk lore, wide sporting knowledge in addition to his trail notes, made him the consummate regional journalist. His like will be missed.